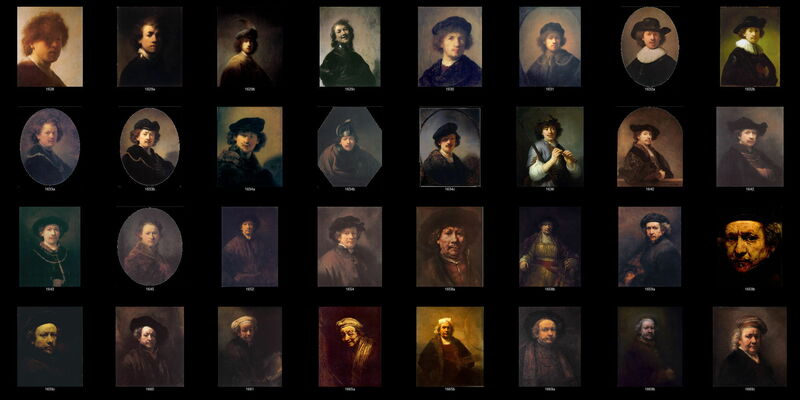 Rembrandt, series of painted Self-Portraits, 32 in all, ordered by date. WikiArt. In the first article of this series, I showed what I mean by series paintings, defined some sub-types, and considered how and when they came about. The second article then examined Pissarro’s series paintings, the third those of Sisley, and the fourth those of Monet. This article summarises what I have considered so far, considers other types of series, their use since 1900, and some ideas as to how we might paint series today. From the outset of his painting career, Claude Monet showed a tendency to paint multiple versions of some motifs, probably as a result of his very high output and artistic aim of exploring the effects of light and ambiance on views. By about 1882, he was starting, perhaps unintentionally, to produce series paintings, and in 1889 painted the first series based on near-identical views of a relatively simple motif and composition. He then set out to build series during the winter of 1890-91, in the main Grainstacks series, which were the first to be shown together as a series. 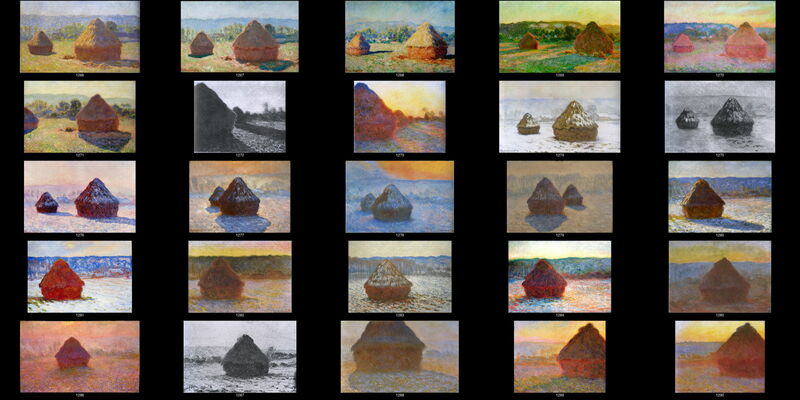 Claude Monet, the complete “Grainstacks” series of 1890-1, referenced by their Wildenstein numbers. From 1890 to 1897 most of his paintings consisted of series; after that period he painted very few canvases which were not part of a series. Although there were exceptions, most of his series paintings were of simple compositions and motifs, without people, and were explorations of the effects of light and other immediate influences. They were in general very successful commercially, and helped him re-establish himself as the leading Impressionist, and a leader of the avant garde. Alfred Sisley showed similar early tendencies, although he more usually adjusted the view and composition slightly between related paintings. These assembled into some quite extensive, but loose and probably unintended, series during the 1880s. More detailed assessment is hampered by the absence of a modern catalogue raisoné, but it was probably not until the early 1890s that he set out to paint series, most notably of the Church at Moret-sur-Loing in 1893-4. Alfred Sisley, some of the “Church at Moret-sur-Loing” series of 1893-4. All the evidence points to this being an attempt to emulate Monet’s success, and that series was also uncharacteristic for him in its concentration on a single, relatively complex building. Sadly it did not appear to have been commercially successful. Camille Pissarro also showed early tendencies towards series, but like Sisley he seldom repeated compositions and views exactly the same. Once I have a copy of his catalogue raisoné I may be able to be more certain of this. On his return from Divisionism in 1890 he was first critical of Monet’s Grainstacks series, then consciously embarked on his own from 1896 until his death in 1903. Camille Pissarro, some of the “Boulevarde Montmartre” series of 1897. These series were quite different from most of his earlier work, and from Monet’s and Sisley’s, in being densely populated, bustling cityscapes, and dominated his later work. They were also relatively successful in the market, although not as lucrative as Monet’s. We will never know whether Sisley or Pissarro would have spontaneously started to paint their own tight series had they not been aware of Monet’s Grainstacks and others, or had Monet’s not been so successful in terms of sales. For Monet, series paintings were definitely a triumph for his career, both artistically and commercially. Pissarro became almost as obsessed with painting in series, and his cityscapes stand as a remarkable achievement so late in an already highly productive and remarkable career. Sisley’s sadder situation is evidence that merely painting series well was insufficient for an overnight change in fortune, and he became more withdrawn and disgruntled thereafter. and usually (but not necessarily) intended to be a series. I further distinguish loose series (the opposite of which is tight), and branched series, as before. The greatest paradox with these series is that they were conceived, planned, and painted as a group, in some cases being carefully tweaked and adjusted to ensure that they fitted into the group better. Yet when they were sold, the series were split up, and in most cases were not brought back to be seen together for many decades after the painter’s death. I have, though, intentionally omitted series paintings which had been made long before the nineteenth century, in particular by Rembrandt, over 200 years before Impressionism. For he, and some other artists, had been avid in painting self-portraits, which were probably the only series intentionally created before the Impressionists: here are 32 of his as an example. Given the remarkable insights gained from such series of self-portraits, it is surprising that most other painters painted far fewer, and that no one appears to have extended the idea to different motifs, until the Impressionists. If series became popular and successful among Impressionist landscape painters, they continued in strength in the twentieth century. Andy Warhol, for example, started with silkscreen paintings such as Marilyn Diptych (1962) in which the whole series is contained on a single support, then produced multiple canvases such as Campbell’s Soup Cans (1962, a series of 32) and those of celebrities including Liz Taylor. I find series of abstract paintings rather harder to understand or analyse, but most abstract painters seem to have felt it important to paint some series, and some appear to have produced little else apart from series; clearly the criteria for abstract series paintings are quite different, probably relying heavily on the intention of the artist. an artistic intention or purpose in the series as a whole, which is reflected in the approach to the individual paintings. Impressionism brought each of these together, which accounts for the appearance of series in the Impressionist landscape painters. They intended to paint quickly in order to capture the moment. They generally, in the early years in particular, painted plein air, aiming to complete a painting in a single session, although later for more complex motifs they painted at the same time of day over a period of several days. Above all else, series painting is about the same subject that is central to Impressionism: the effects of light and ambient conditions on the appearance of the world, and expressing those faithfully in paint. Will the series be strictly ordered? There does not seem to be any indication that Impressionist series were intended to be shown or viewed in any particular order, but order can allow then to build narrative, much as in ‘graphic novels’, etc. How will you co-ordinate properties such as colours and surface between them? You may need to use the same medium, possibly even the same paints, tools, and techniques if you wish to maintain consistency. Will the supports be identical? Again this is important for consistency across the series, although the Impressionists often used different sizes of canvas. Where will you be able to put the whole series on easels so that you can tune them as a series, if you wish to do so? 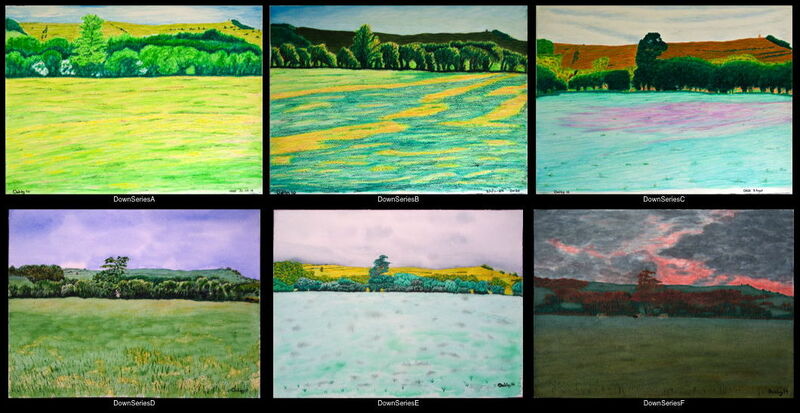 Do you intend selling them as a set, or using Monet’s approach of the ‘limited edition’ to enhance individual value? How will you document the individual paintings, and the series as a whole? If they become dispersed after sale, it is essential to keep good image records. I offer as a simple example a series which I started five years ago, using the view from our back door through two hedgerows to the chalk downs beyond. I am adding to the series at a slightly faster rate than Rembrandt painted self-portraits, changing medium and much else, and the paintings reflect my own improving techniques. Howard Oakley, series Out the Back (2010-2014 and continuing), water-based media on paper, various dimensions. © EHN & DIJ Oakley. Perhaps they are the landscape equivalent of serial self-portraiture after all. Posted in Painting and tagged abstract, Andy Warhol, Impressionism, landscape, Monet, Pissarro, Rembrandt, self-portrait, series, Sisley. Bookmark the permalink.